Experiencing the graphic novel, Mesmo Delivery, is a physical challenge on par with a bar fight. You don’t exactly know what to expect. You get hit from all angles and you swing blindly hoping to slam into something concrete that will at least help you collect your bearings again. You can smell the blood. You can smell the bodies. Every time you turn the page you encounter an assault on the senses unlike any other you have experienced before in a comic. And when you finish reading it, you walk away with pride knowing you stood your ground and persevered. You leave the experience with the comic tucked in your arms like some trophy dame that recognized you as the last one standing. You leave exhausted and battered and you rush to find someone else to throw into the rumble. 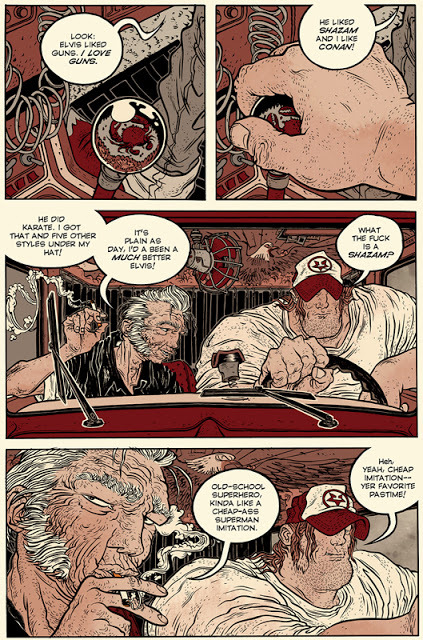 Mesmo Delivery, by Rafael Grampa and Marcus Penna drags you into the story involving Rufo, an as-big-as-a-semi-truck ex-boxer, and Sangrecco, an Elvis impersonator that is as dirty and greasy as his glistening sideburns. We are introduced to the two characters and the basic plot that they are transporting an 18-wheeler of unknown contents to an anonymous client. And therein lies the beauty of this book, its seeming simplicity. The major conflict of the story is fairly predictable; tough guy walks into a bar full of tough guys and fights break out. But, the story combined with the jaw-dropping (and/or shattering) art by Grampa makes it very clear you’re experiencing something that is far from plain. Fine detail seems to be a specialty for Rafael Gramps as you can clearly see in the reflection of the shifter knob, the wrinkles in the clothing, the grains on the hands, etc. Grampa also displays a keen ability to play with choreography on the page. For example, on page 28 when Rufo takes a boot to the noggin’ he releases the understandable, “mmmmf”, but Grampa details the dialogue bubble almost like a snake slithering out from his mouth and curling up the page. Grampa does this often in the comic where you will see something normal being done drastically different and it takes you by surprise. Mesmo Delivery became my “go to” comic for any friends who said they are, or want to be more immersed in graphic narrative. The story is engaging with a clever twist at the end. 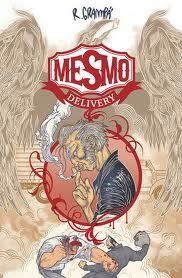 Sacrifice your body, take the beating, read Mesmo Delivery. Pick up a copy at your local comic store or order direct from Amazon. Randall Lahrman resides in San Diego where he is completing his MFA in Fiction at San Diego State University. He spends his free time with his beautiful wife, Cayse, and his daughter, Genesee. He frequents the local comic shop every Wednesday in search for the latest adventures from The Batman, The Goon, Deadpool, Wolverine and many others.